Raised bed gardening is a popular pastime, and you can enjoy it in even the smallest back yard. This form of gardening is a great choice for people who at any level of experience; those who are new to gardening can try it out to see how they like it and more experienced gardeners who live in homes with limited back yard space don’t have to give up a pastime that they love. By starting your raised bed garden in early spring, you will be able to plant it earlier than if you were trying to place your seeds in unmounded soil. The soil dries and warms up more quickly in the spring in raised beds. In comparison with trying to plant a garden on the ground, a raised bed has much less foot traffic. You won’t have anywhere near the same level of soil compaction, which makes it difficult for plants to thrive. When planning your raised beds, make them narrow enough so that you will be able to reach to the centre comfortably from the footpath running alongside them. That way, you’ll be able to plant, water and weed them without having to stretch too far. You can make each one as long as you like, though. Even if you think you will be an enthusiastic raised bed gardener, it’s a good idea to start with one or two beds in your first year. You can always add more of them the following year. Choose a well-drained site that gets a minimum of six hours of sunlight per day. You should also choose a location that is close to a water source. Since this type of garden is raised, you will need to keep a close eye on the moisture content in the soil in the beds. Be careful and water them generously, so that the beds do not dry out. 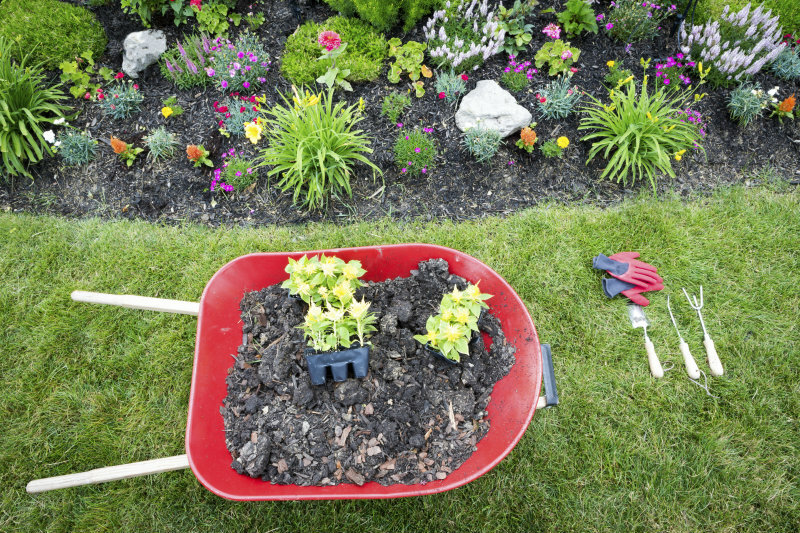 If the soil is compacted, you’ll need to wait to prepared the bed until the soil is dry enough that you can pulverize it into small chunks. Spread a two-three-inch layer of organic material over the soil. You can use leaves, sawdust, compost, ground bark, planting mix or manure. The additional source of nitrogen will help the organic material break down more quickly. Use either a spade or a rototiller to mix the supplemental nitrogen and soil to a depth of six inches. Next shape your raised garden bed. Shovel a walkway area, about 18 inches wide to a depth of six inches. Add the excavated soil to the top of the bed garden. The finished beds should be about 8-12 inches higher than the paths. Level the top with a rake. Add some sawdust or bark to the paths between the beds to define the space and to make a less muddy walking surface. Plant your seeds or plantings so that they will be evenly spaced. Fertilize and water as necessary. Keep the walkway dry to minimize weeding required. Place stakes at the corners of the beds so that you don’t drag your hose across your plants when using it. If you are growing vegetables, the best material to use is the new snap-in place plastic boards. They will not contaminate the soil. Old railway ties are soaked in creosote, which can leak into the soil and your plants. You can pile up stone to make walls, but it is time-consuming and you run the risk of injury from moving piles of rock. Wood will rot over time. If you want to find the perfect home with space for a garden of any size, Daniel and Bonnie Wan can help you find one that will be a great fit for your needs and budget. Give them a call today. This entry was posted in Real Estate Tips and tagged Curb Appeal. Bookmark the permalink.